We have in stock a standard party box which is clear plastic and measures 6cm square around the bottom, 8.5cm high and 8cm square around the top. Each box comes with a printed tag which co-ordinates with the invitations you are purchasing. The tag can be customised to suit your needs and can double as a thank you card. If you are not purchasing invitations but would like us to customise a box to match the theme of your party, we can do that. We'll email you after your order is placed to find out your party plans. Each box comes flat with a plastic handle. The box looks great with or without the handle. 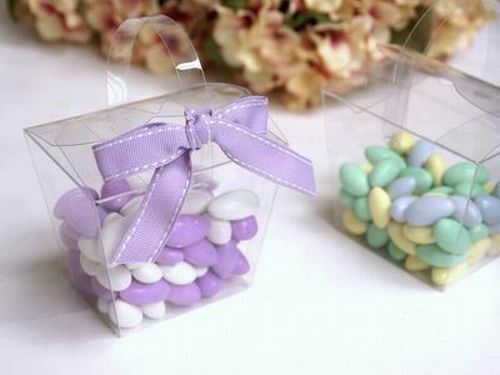 Ribbon, embellishments and sweets are not included BUT I am happy to give you some ideas and inspiration on how to finish the boxes so they look the part!